Thanks for visiting Lakota Leathers Ebay sales. Lakota Leathers produces the finest instrument straps that you can purchase. This auction is for one Lakota Leathers Buffalo hide banjo strap. Each of our banjo straps comes with a single 48″ tailpiece that completely circles your banjo pot assembly, then attaches back to the main section of the strap. It is safely secured by 2 Chicago screws. (see video below) Our straps are the softest, most comfortable strap you will ever try. The bison hide is very unique and supple and offers unsurpassed comfort and strength. 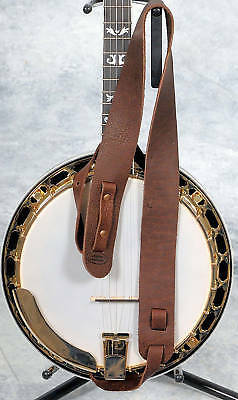 The strap in the photo is one of our ‘chocolate’ banjo straps. These straps are available in four colors; black, chocolate, saddle, or tobacco. Please specify your color choice when ordering. If you do not specify, you will receive the chocolate color as shown in the photos. Our straps are produced on the Pine Ridge Indian reservation in South Dakota and are 100% guaranteed. Each strap sold will help a family on the reservation. Pine Ridge is home to the poorest county in the entire United States. Thanks for stopping by.